If you’ve been paying attention to the world of fitness-trackers, you’ve probably heard of the Fitbit brand by now. The Fitbit Charge 2 HR is one of the best-selling devices from this company, and after reading reviews and trying it out for yourself, it will be easy to see why. The design of this wristband allows for users to wear it all day and night. You can rest assured that this device is accurately counting every step, flight of stairs, and moments of rest that you engage in throughout the day without you having to worry about turning on any extra settings or enabling additional features. For a fitness tracker with such a sleek design and significant degree of customizability, the Charge 2 HR goes above and beyond what many of its competitors can offer in regards to activity monitoring and data interpreting features. Almost everybody will find a reason to love the Fitbit Charge 2 HR. This device is an accurate and efficient way to measure activity levels throughout the day, lets you know how restful your sleep has been, and is even a stylish accessory that is great for telling time and staying updated continuously with call and messaging notifications. The Charge 2 HR has all of the essential features that are also available in most fitness trackers that are available on the market. From going on a run, walking around at work, and even sitting on the couch, this wristband is quietly tracking your all-day activity. While you’re sleeping, the Charge 2 is working hard to record sleep stage information that will give you insights regarding how to have a more restful night’s sleep. If you forget to log a workout, with the use of SmartTrack technology, the Charge 2 can automatically detect record activities like hiking and biking even if you don’t remember to enter in any information. Additionally, if you’re anything like me and enjoy switching your workouts up throughout the week, the multi-sport mode is a handy tool because it allows you to program in different activities (yoga, sports, running, etc. ), so that workout stats are accurately recorded and displayed. With my work, I often find myself sitting at the computer for hours and forgetting to take breaks. The Fitbit Charge 2 HR can make sure that I get up and move around because it has a Reminder to Move feature that encourages you to take at least 250 steps per hour. The Charge 2 is available in different sizes, and when you purchase this product, you can choose from a variety of interchangeable wristbands. After buying this wristband, you also receive access to the Fitbit app. This app has come a long way from the one Fitbit first launched. The Charge 2 wirelessly syncs to 200+ iPhone, Android, and Windows devices. The Fitbit app also has a goal-setting feature that you can use to keep yourself accountable and can help you track weight loss goals by helping you to plan meals, log daily food intake, and track your weight and BMI. Heart rate tracking and workout records are also stored in the app and get displayed through a series of charts and graphs that makes for more accessible and more meaningful interpretations of the information that the app is storing. The Fitbit Charge 2 is a fantastic purchase for just about everybody. Anybody from extreme training fitness gurus to people who enjoy occasional yoga or light walking sessions will find something to love about this wristband. If you’re looking for a device that is more watch than fitness tracker, this may not be the right purchase for you, but otherwise, the Charge 2 comes highly recommended. The interchangeable bands are a nice feature of the Charge 2. Customizability ranges from a simple black design to bold and vibrant colors. The Special Edition trackers that are available even allow for the opportunity to purchase unique band textures and finishes. Fitbit offers some unique sleep insights that are available through this wristband. The Charge 2 automatically tracks sleep duration and consistency and even can wake users up with a silent alarm. Heart rate data is also used to give insight into sleep stages and can paint an accurate picture of the levels of sleep users drift in and out of during the night. The new Cardio Fitness Level tracker that the Charge 2 has provides a snapshot of the current state of your physical fitness level. A personalized Cardio Fitness Score uses information that is collected from the user’s VO2 max and uses that to provide a fitness level rating that ranges from poor to excellent. While using this feature, the app will give exercise frequency and intensity suggestions that can aid in weight maintenance or loss. Call, text, and calendar alerts are all displayed in a relatively primitive way with the Charge 2. When you receive a new notification, the signal will pop up on your wristband, but the capabilities end there. It’s still necessary to go to your phone to respond or interact with any of the notifications that you have received. A few Fitbit Charge 2 reviews have complained about the GPS feature. For the GPS connected mode to work with this wristband, it has to maintain connectivity with your smartphone, which defeats the purpose of having GPS capability on a fitness tracker. If you’re willing to have your phone on you when you go out for a run, this may not be an issue for you though. Lack of waterproofing will be an issue for some when they are deciding whether or not to purchase this wristband. Unlike some other fitness trackers available, the Charge 2 isn’t able to track swimming exercises, and you won’t be able to shower with the wristband. You don’t have to be super tech savvy to utilize all of the features that the Charge 2 has to offer. This product requires a relatively low amount of user interaction because most measurements are either tracked automatically or can quickly get recorded after pushing a small button on the side of the device. The OLED touchscreen is larger than previous versions of the Charge, which is a nice change. For the most part, a series of swipes and taps on the face of the touchscreen controls the Charge 2. The screen is illuminated by a turn of the arm and will display the time, date, and steps walked. This version of the Charge has customizable clock faces so the exact information that pops up on the screen can vary. Users can even opt to have a traditional clock face pop up on the screen if they prefer. The Fitbit Charge 2 tracks all of the essential functions that consumers have become accustomed to such as steps, flights climbed, sleep cycles, and reminders to get up and move. A few features that are present in this wristband that some other competitors do not offer include cardio fitness level monitoring, multi-sport tracking capability that can syncs with a GPS, and even guided breathing sessions. Although a few other brands are beginning to incorporate some of these features into their products, the Fitbit app still tends to run supreme. While some other fitness apps can seem cluttered and confusing, Fitbit has done a fantastic job with keeping their app intuitive and informative. This app quickly aggregates activity trends and provides user-friendly feedback. The Fitbit app does a great job using your statistics in a way that makes goal tracking a breeze. Pure Pulse Heart Rate: The heart rate monitor that the Charge 2 uses has a PurePulse technology that continuously and automatically tracks heart rate so that users can get a better glimpse into the current status of their overall health. Benefits of continually having access to your heart rate include improved chances of reaching weight loss goals, the opportunity to optimize exercise routines, and stress-level monitoring. Multi-sport Modes: Fitbit’s Charge 2 HR isn’t just for avid runners. Users with all different fitness interests can benefit from this tracking device because of its ability to efficiently record a vast array of exercises ranging from weight-lifting to yoga. Cardio Fitness Level: VO2 max monitoring is widely used by professionals to assess cardiovascular fitness. This tracking capability enables users to receive a Cardio Fitness Score after completing at least a 10-minute long run on a flat terrain surface. This score is useful because it provides users with an indication of their current fitness level and even compares scores to other people who are of the same gender and in the same age range. Guided Breathing Sessions: The Relax feature of the Charge 2 receives information that comes through the heart rate monitor, and is uses it to measure heart rate variability so that a personalized, comfortable breathing rate can be designed. With this feature, you can select two or five-minute breathing sessions that will provide biofeedback to help you become more mindful, calmed, and focused. Battery-Life: Even with its relatively large screen size, with regular use, the battery of the Fitbit Charge 2 should last for up to five days. After the battery has completely drained, a full charge is obtainable in less than thirty minutes, which is quite impressive. Most Fitbit Charge 2 reviews on Amazon are giving this device a ton of praise. Users are happy with the sleek design of the wristband and its comfortable feel. The new version of the Charge wristband has gone through a complete design makeover. The newly extended band clips are getting a great deal of praise, and fashion-forward users seem to appreciate that the wristband can be colored rubber, metal, or leather depending on personal needs and preferences. The main complaint of the Charge 2 seems to stem from its varying levels of accuracy. Some users have said that this device has dramatically overstated the actual amount of steps that they have walked on any given day. This problem is common in almost all fitness-tracking wristbands, so it is not a downfall that only explicitly affects the Charge 2. Additional praise for this wristband comes about thanks to the heart rate monitor feature. A customer has said that thanks to this monitoring capability, “workouts are more intense and my heart rate is staying in the fat burning zone longer.” Overall, customers are delighted with the vast array of tracking capabilities that the Charge 2 offers and the Fitbit app integration features are also receiving rave reviews. Compared to the original Charge, Fitbit has made a ton of useful upgrades to the Charge 2. This new version of the Charge comes equipped with new features that target health documentation and fitness information in a meaningful way that can be used to influence positive changes regarding workout style, relaxation techniques, and person overall fitness plans. The design of the Charge 2 is more user-friendly, and the customizability options are attractive for a lot of people. If you’re just looking for a standard fitness-tracking wristband, the price of the Charge 2 is higher than some similar competitors, which could make this a less attractive choice. The Fitbit brand has an excellent reputation, though, so paying a little bit extra for a reliable name brand seems pretty fair. 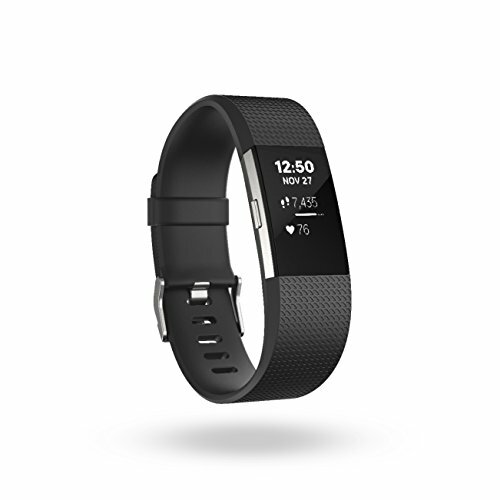 For fans of the Fitbit brand, this purchase is a no-brainer. The Fitbit app is engaging and pretty fun to use, so other users will find this an attractive way to track and interpret their fitness data.